Part of the military lifestyle is accepting that there will be some special times your significant other will miss out on. 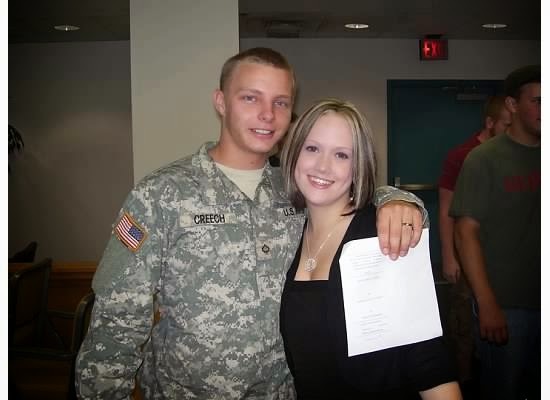 In our particular case, my love is away at Jumpmaster school and today is our 7 year wedding anniversary. We're not big on getting each other extravagant gifts or going out to fancy dinners - it's just not our style. So I suppose him being away isn't so bad. I miss him like crazy, don't get me wrong.. but if he can pass this school and get home soon, that would be the best anniversary gift ever! Once he gets Jumpmaster, it's on to putting in his packet for Warrant Officer -- but that's a different story for a different day. I thought I would share a few pics of our wedding. I don't think I ever put them out on social media before because we got married at a courthouse, so I didn't feel like they were anything to brag about. But now that it's been 7 years, I look back on these pictures and smile. First of all, why didn't any of my family or friends tell me that my hair looked like a zebra?! So glad chunky highlights are a thing of the past! I also love looking back and remembering that I didn't wear a fancy dress, just one that he loved. It may have not been the wedding we were dreaming of, but we still have our happily ever after - I wouldn't change a thing! We have been together for 10 years, married for 7 and I still feel like the luckiest girl in the world to be married to my best friend. We balance each other out so well. He's an amazing daddy to our babies and he would bring me the moon if I asked. I love him so much and I don't tell him often enough.. Your wedding photos are beautiful. It must be hard to have your hubbie away from you. I hope you are able to connect by phone or computer. Happy Anniversary. I don't think you needed a traditional wedding dress, what you wore was just fine. I think it actually looks better next to camo =) Happy Anniversary! Thank you! It's been amazing! So sweet! 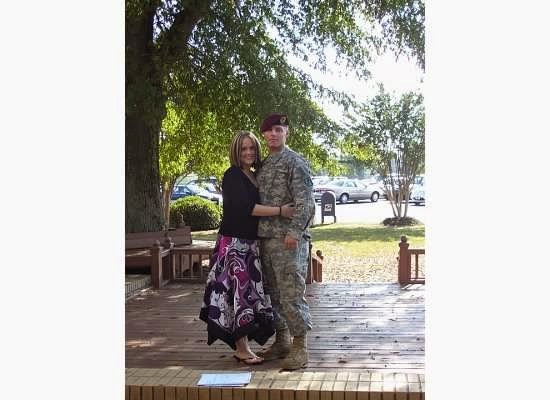 Thanks for sharing your beautiful wedding pics, and thank you to you and your husband for your sacrifices and service! Happy Anniversary! My 6th wedding anniversary is coming up in a couple of weeks too. Happy anniversary! Marriage is the best, we are going on 18 years!